Summer (at last!) here in the north, and under the care of the lovely and talented Mrs. Zheng3 the grounds do bloom and shake off spring's clammy mantle. 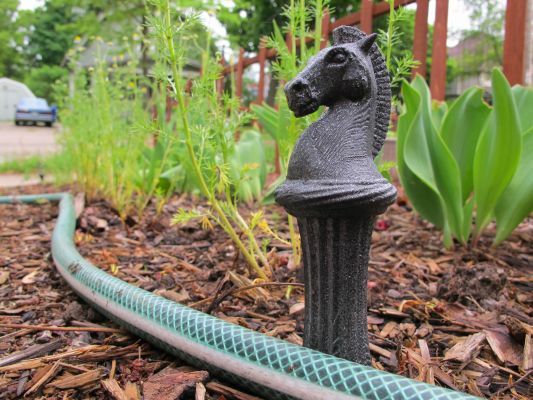 Irrigation is the order of the season, and polyurethane serpents dutifully follow our favorite chatelaine while she quenches the thirsts of young basils, zukes, and tomatoes. But she is busy, busy! and without a garden guardian's vigilance an overlooked dragon's tail might scythelike reap a row of tulips. It has happened before. Never again, my friends. Never. Again. Print in halves, sandwich around a #8 galvanized spike, and secure with your adhesive of choice. Here at Zheng Labs we are partial to Gorilla Glue (http://amzn.to/1kEw9bO) for permanent applications. Love this Shakespearean sound: "do bloom and shake off spring's clammy mantle". Love this Guardian; it's a remix that doth well guard the tender green shoots from that scaly slithering beast.